﻿﻿﻿﻿﻿﻿﻿﻿﻿﻿﻿﻿﻿﻿﻿﻿﻿﻿﻿﻿﻿﻿﻿﻿The blogosphere has been filled with comparisons between the 2007 WTHR Indianapolis Mayoral Poll and the 2011 WISH poll on that same subject. 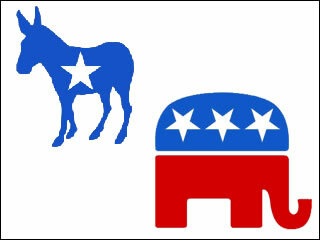 Democrats have been pointing out similarities between the two polls while Republicans accuse the Democrats of spin. Where is the truth? As oe might expect, somewhere in between. Let's take a look at the two polls. ﻿WTHR Poll. Was conducted between 10/21 and 10/24 with the election on 11/6. WISH Poll. Conducted about a week later in the campaign season, between 10/29 and 10/31 with the election being on 11/8. Both sample sizes were about the same, with identical 4.9% margins of error. WISH Poll: 62% for Ballard (poll also asked additional similar questions such as whether the Mayor was viewed favorably (65%) and whether City was moving in right direction (55%). Undecided Vote: What seems to have happened in the 2007 election is that the 4% of the 13% undecided vote in the 2007 poll ended up going to incumbent Bart Peterson while Ballard picked up 9%. Thus the ratio of undecideds going to the challenger v. incumbent in 2007 was just over 2-1, right in the ballpark of what normally happens. What the difference from the poll and the election was that 3% of the 5% Libertarian support in the poll seems to have gone to Ballard on Election Day. That's not particularly surprising as many Libertarians reported abandoning Fred Peterson as a candidate and supporting Ballard, who openly courted Libertarians. In fact, that 3% Libertarian support for Ballard made up almost the entire winning margin. In 2011, if there is a similar 2-1 break on the undecideds, then Ballard receives 51% on Election Day and Kennedy receives 47%, almost a duplicate of the 2007 election result. Favorable Rating of Incumbents: This is pointed to as a difference between 2007 and 2011, namely that in 2007 Peterson was unpopular and people were unhappy with the direction of the City, while in 2011 Ballard is popular and people are happy with the direction oft he City. While there is some truth to that, it appears to be exaggerated. See below Job Approval and Right Track/Wrong Track discussions. ﻿Job Approval: In 2007, the WTHR poll asked about Peterson's job approval. It came back at 50%. In 2011, a job approval question was asked about Ballard and the result was 62%. (The WISH poll has a question as to whether Ballard is viewed "favorably," a question I didn't see in the 2007 poll. That 4% difference could be viewed as people personally liking Ballard while not being happy with his job performance.) The difference between 50% and 62% is not huge, though I would point out in a bid for undecided voters a slight difference might be all that matters. Right Track/Wrong Track: What I did not see in the reporting of the 2007 poll was a right/wrong track question. Pundits are claiming that in 2007 things were seen as being on the wrong track while now it is on the "right track." But the 2011 right track poll numbers was only 55%. Since Peterson received 50% approval rating, and voters were personally angry about him over tax increases, I think it quite possible that a 2007 right track number could well have matched the 2011 one of 55%. While I originally thought this was a major difference between 2007 and 2011, and possibly a reason Ballard might do better than losing the undecided voters 2-1, I'm now convinced the difference between the two election years has been exaggerated. The Negative Campaign: Kennedy has been criticized as running a negative campaign. Many people point to that as the reason she's behind in the WISH Poll. But the fact is in the WISH Poll only 10% of the people cited a dislike for Kennedy as a reason for saying they were voting for Ballard, while 11% of the people cite being against Ballard as a reason for their preferring Kennedy. 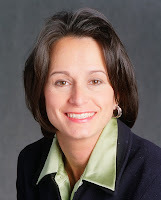 Basically, in a two way race involving an incumbent, there are four ways of voting: voting for the incumbent; voting against the incumbent; voting for the challenger; and voting against the challenger Challenger Kennedy simply cannot win by only saying why people should vote for her. An incumbent election is a referendum election. She has to say why people should not vote for Ballard. Kennedy's problem thus far is that she failed to be specific enough in making the case against Ballard. Turnout: Ed Treacy may be a complete failure when it comes to PR, however, he receives an "A" when it comes to turnout. Treacy wasn't chairman in 2007. I would give the Democrats a 5% election day advantage just because Treacy is such a master at turnout. Republicans would be foolish to expect a 2007 style turnout, where significant numbers of Democrats stay home and Republicans go to the polls. That unusual 2007 turnout is the reason why the Republcians won the council. Democrats are going to turn out in much better numbers in 2007. While it is quite possible Ballard wins, he is unlikely to have much if any coattails. There will be ballots all over the county where the voter casts a vote for Ballard and for Democratic council candidates. The at-large races are "default" races, races where people fall back on voting their party because they really don't know the candidates. While large expenditures that candidates such Angel Rivera are making can influence those races, it is typically an influence of only a few points at best. The numbers are the numbers. With Marion County Democrats having a 10% advantage in 2010, a great Republican year and 20% in 2008 which was not a great Republican year, I'd be shocked if any Republican at-large candidates win. 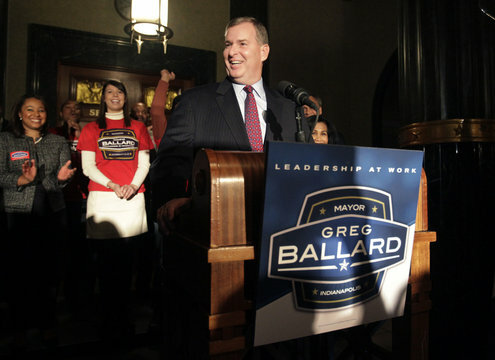 But Ballard, as a high profile candidate, could beat the Democratic baseline. WISH Poll Oddities: There were things about the WISH poll that seemed rather odd. Although the 2011 WISH poll was conducted nearly a week later into the campaign season than the 2007 WTHR poll, the number of undecideds was significantly higher in the WISH poll versus the WTHR poll, 22% to 13%. Given the poll is a week later and given that challenger Ballard was a complete unknown in 2007, while challenger Kennedy ran a high profile, well-financed race for prosecutor in 2006, one would think the number of undecided voters at this stage would be smaller than the number in 2007. Another thing that is odd is that even though Ballard has a 62% approval rating, his poll number was only 44%. That is an 18% difference. In the 2007 poll, Peterson's approval rating was 50% and his poll number was 43%, only 7% difference. Given Ballard's approval rating, one has to be stumped why he isn't polling higher. Also, it is hard not to overlook that 44% number in the WISH Poll. Any time an incumbent polls under 50%, that is considered to be a sign the incumbent's campaign is considered to be on life support. Ballard is not only below 50%, he is significantly under that magic number. Normally incumbents below 50% are that low because they are unpopular, which is why the challenger normally picks up most of the undecided voters. While normally I think it would be extremely difficult for an incumbent to gain 6% of the undecideds, the fact is there are so many undecided voters according to the WISH poll and since Kennedy has not made a strong case against Ballard, I think it is possible that the undecided voters will break enough for Ballard to win the election. A 50-50 split of the undecided voters is an Abdul pipe dream. A 2-1 split in favor of Kennedy is more likely and that split would make Ballard the winner of a close election. Last Four Days of Campaign: Kennedy has four days to do a lot of work. The problem is she did not complete the task of defining Ballard, i.e. making the case for why Ballard should not be re-elected. I have been preaching for awhile that Kennedy needs to be specific in her ads. Instead of making general allegations about sweetheart contracts, she needs to go after Ballard for the Pacers $33.5 million giveaway, the ACS 50 year parking meter contract, the Broad Ripple Parking Garage giveaway, the $100 North of South project. The problem is that defining one's opponent has to be done early enough in the campaign so the campaign can double back to positive ads for the last few days. I am skeptical Kennedy has the time to do that. I do believe though the election for Mayor is going to be much, much closer than people have been led to believe by the media coverage of the WISH poll. Here is a link to the WTHR story on the 2007 polling result and a link to more specifics on the poll. Here is a link to the WISH story on the 2011 poll. Great analysis as usual, it will be interesting to see what happens on Tuesday. I'm still curious if in the 2011 poll, they polled "likely voters" or "registered voters", two completely different things as most people know. Also, I wonder if they polled cell phones; with more than 30% of HH being cell-only, I'm convinced that it's difficult to maintain accuracy without doing so. Rick, it's very hard to poll cell phones. Those lists are not easily available. Plus they'd have to cross them with demographic and voting data. Darn near impossible. Pollsters know that more young people are cell only, so they try to overcompensate by polling more younger voters who have cell phones. I should hope they put a "likely voter" screen. Turnout is so low in a muni election,that it would be very foolish to not do so. The screen is probably based on voting history. It doesn't work too well to screen for likely voters in the phone script. If you ask people if they're going to vote the answer almost always is yes...though they often don't.